Recorded at The Tranzac's Main Hall (Somewhere There Creative Music Festival – Show 4), February 25, 2018. 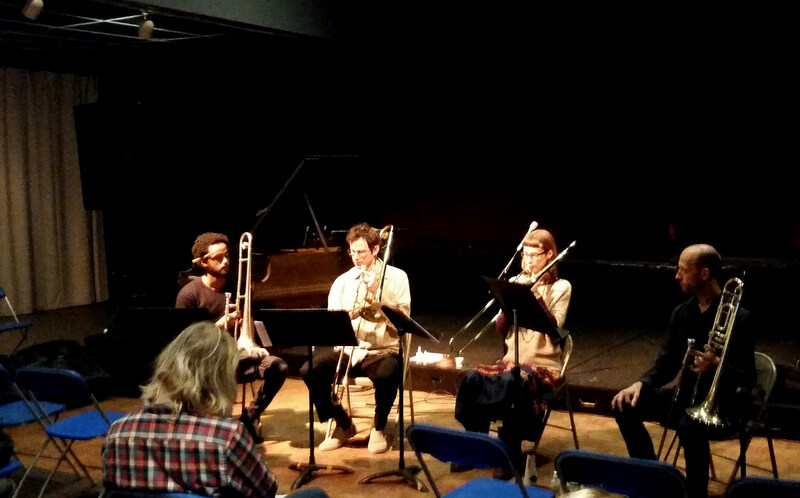 Building on the tradition established with last year's saxophone quartet, the Somewhere There Festival once more showed its commitment to new music with a call for compositions — this time for trombone quartet. And once more the ensemble — consisting of Tom Richards, Heather Saumer, Doug Tielli and Nebyu Yohannes — preceded a concert of the commissioned works with an open rehearsal, giving non-players a window into the process of how a group and composer navigate the mutual discovery of how a new piece "works". Of the three pieces chosen, Logan Mills' "Fork" was the most conventionally scored, although there was a lot of mathematically-intricate trickiness in a piece based on harmonic interrelationships he had been musing upon while working as a piano tuner. Susanna Hood's "Mobile", on the other hand, offered a procedurally-intricate text-based score that had the players spacialized (and spinning around) like the parts of a wind-tossed mobile. Scott Thomson's "4 for 8" was even more open ended with two sets of variables on a numbered line leading to a "rehearsal" that was as more of a negotiation over how to interpret the piece than a musical struggle. (Thomson, who was present, saw no need to impose any authorial wisdom on the players, who ultimately decided to play the piece following two separate rule-sets, leading to two rather different results.) The concert was closed out by this untitled miniature from Doug Tielli, which sounded not unlike street-corner Salavation Army band lullaby.